Hareidi MK: decision to cut budgets for hareidi men – while funding draft dodgers – proves the real problem is hatred. A Knesset decision Wednesday “proves beyond all doubt that the ongoing persecution of full-time Torah students stems from fundamental hatred,” MK Yaakov Asher has accused. MK Asher, a member of the hareidi-religious Yahadut Hatorah (United Torah Judaism) party, leveled his accusation after a proposal that would have seen draft-dodgers at secular academic institutions lose funding was withdrawn from the Knesset’s agenda. The proposal was put forth by MK Yoni Chetboun of the Bayit Yehudi (Jewish Home) party. Chetboun argued that hundreds of young, secular Israelis are avoiding the draft each year, and instead are continuing directly to higher education. The situation is an outrage due to the fact that the draft-dodgers study at the state’s expense, he argued. Their tuition, like other students’, is heavily subsidized; according to Chetboun, this allows them to benefit from the state’s funding while refusing to contribute in the form of IDF servce. The decision to pull the bill shows the government’s hypocrisy, MK Asher accused. 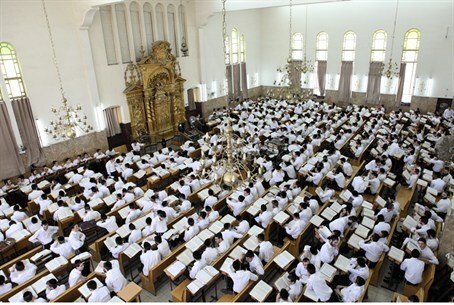 The government previously announced plans to link funding for yeshivas to the enlistment rates among their students – a serious financial blow to hareidi institutions. When it came to the proposal to similarly cut funds for secular draft-dodgers “it would have been natural for this proposal to get automatic support from every member of government, since the issue of ‘equal share in the burden’ worries them so much,” he said. “But the proposal was suddenly dropped from the daily agenda, after Education Minister Shai Piron appealed to the government,” he continued. “It’s very interesting to see that when it comes to those who are not religious, those fighting for ‘equal share in the burden’ do not raise an outcry,” he said. The “hypocritical” approach proves that the real issue is “fundamental hatred for Torah students in the land of Israel,” he charged. “There is no end to this government’s hatred and cynicism,” he concluded.